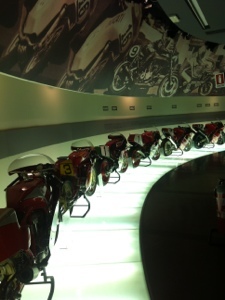 The Ducati museum in Bologna: fun for everyone! Once you have had a chance to visit some of the Cultural and Culinary treats that await you in Bologna, it is time for a visit to the Ducati Museum and Factory to experience Italian motor engineering and style at its’ best! Ducati has been making motorcycles since 1946, and at the Ducati Museum, located at the factory headquarters, you can learn how their product has evolved over the course of the last 70 years. This is no stuffy old-fashioned museum, but a modern and award-winning attraction that will delight young and old alike, so do not miss it! The museum, which opened in 1998 has been arranged to represent an illuminated racetrack, featuring 33 iconic motorcycles from various periods of the company’s history; Adding to the WOW factor, the spectator area is situated inside a massive red helmet! After you have had a look at the cycles on the “track” you will proceed through 7 themed rooms, where you can learn all about the Brand, the dream and the reality that is Ducati today. You will see the history of the company, its’ most important innovations and an overview of the 30 years before the first motorcycle was produced. You will learn about the Ducati motor racing heritage and the people who made it all happen. The story starts with the Cucciolo, (puppy, in Italian!) the first engine produced by the company in 1946 (designed by Aldo Farinelli) after World War II, when there was a desperate need for a cheap form of transport to boost the economy. The Cucciolo was basically an ordinary bicycle fitted with a very economical 4-stroke engine, which could carry two people up and down the many hills in the area. You will then follow innovations which resulted in Ducati becoming the envy of the motorcycle industry and won them many prizes at Superbike World Championships. The final exhibit is of the Desmosedici cycle, which introduced a new generation of racing engines from the company. 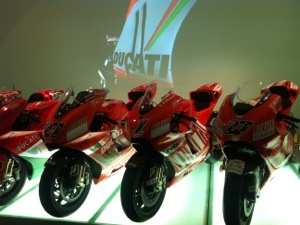 Tours of the Factory and the Museum are conducted by a Ducati guide 4 times each day, and need to be booked in advance. Plan to visit from Monday to Friday is possible, as the factory tour is not available on Saturdays unless you are a member of the DOC – Ducati Owners Club! Times are 9.15, 11.00, 13.45 and 15.30 and it will cost you €10.00 to visit. Bookings can be done online at www.ducati.com or by telephone: +39(0)516413343. Bologna is easily reached from all parts of Italy by train, plane or car. It is just 1 hour from Florence, 2 hours from Milan and Venice and 3.5 hours from Rome. If you are flying into Bologna airport, you can get a taxi which will take you to the factory in 10 minutes. From the centre of Bologna, the best way is to take a suburban train, which will only cost you about €1 and takes just 10 minutes. Then grab a taxi for the short ride to the factory. You can also take a bus from the centre of Bologna; although this takes quite a bit longer (40min) and requires a change of busses along the way, you can get off at “Borgo Panigale” stop and then walk just 200 metres to the Company. Take a no 36 or 39 to Via Lame and then change to No 13 going towards Borgo Panigale. Organised Ducati tour in Bologna. For those not fond of fiddling with reservation and Italian publish transport, Emilia Delizia can organise a chauffeured Ducati museum and factory tours. We will book and reserve spots for you and provide transport, you can also combine the Ducati factory and museum visit with the other super car factory and collection in the area. Super bike collection at the Ducati Museum. Author gabriele montiPosted on 29 April, 2013 29 April, 2013 Categories Bologna, Motorbike toursTags Bologna super bike museum, Ducati, Ducati museum tour, how to get to ducatiLeave a comment on The Ducati museum in Bologna: fun for everyone!